During each legislative session, hospital champions from across the state visit the NC General Assembly to advocate for hospitals, our patients, our employees, and our communities. Advocacy Day allows hospitals to meet face-to-face with their legislators to remind them of the important work hospitals do and to encourage members of the General Assembly to know the impacts of legislative decisions on our ability to continue providing high-quality care for all in the community. Advocacy Days are coordinated at least once during each legislative session and all member hospitals are encouraged to participate. To confirm your health system’s participation in one of the advocacy weeks below, please complete this brief online form. You will be contacted by Emily Roland, Member Advocacy Director, to help coordinate your participation. 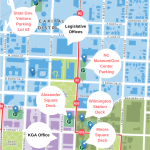 The NC Museum/Government Center Parking outdoor lot is located at 100 E Jones Street. This lot is closest to the Legislative Building (LB). This lot costs $2/hour and there is not a daily cost cap. The State Government Visitor Parking Lot #2 is a covered garage located at 333 N. Salisbury Street. This lot is closest to the Legislative Office Building (LOB). This lot costs $2/hour with a max cost of $16/day. The Wilmington Station Deck is a covered garage located at 115 S Wilmington Street. Visitor parking costs $2/hour with a max cost of $12/day. This deck is closest to the Kairos Government Affairs office and relatively close to the legislature. The Alexander Square Deck is a covered garage located at 120 S Wilmington Street. Visitor parking costs $2/hour with a max cost of $12/day. This deck is located right across the street from the Wilmington Station Deck, and is close to the Kairos Government Affairs office and relatively close to the legislature. The Moore Square Deck is a covered garage located at 233 S Wilmington Street. Visitor parking is $2/hour with a max of $12/day. This deck is very close to the Kairos Government Affairs office, but a bit farther from the legislature. The Legislative Building (LB) is located at 16 W Jones Street, Raleigh. The Legislative Office Building (LOB) is located at 300 N Salisbury Street, Raleigh. *The mornings of June 5, 6, and 7 (Behavioral Health Advocacy Week), advocates will meet at the Kairos Government affairs office from 8:30 – 10 a.m. for a brief orientation and issue briefing. Legislative Building Cafeteria – located in the basement of the LB, seating is limited, open from 11 a.m. – 2 p.m. Legislative Office Building Snack Bar – located on the first floor of the LOB, open from 7 a.m. – 3 p.m.
On June 5, 6 and 7th (Behavioral Health Advocacy Week), NCHA will provide lunch vouchers to participating advocates. Lunch vouchers can be picked up during the morning orientation session at Kairos Government Affairs (209 Fayetteville Street) from 8:30 – 10 a.m. Vouchers can only be redeemed in the Legislative Building Cafeteria. If you need vouchers in advance, please contact Emily Roland at eroland@ncha.org. Issue briefs and talking points for each of the 2018 NCHA state legislative priorities can be found on the NCHA website here. What To Know Before You Go (what to expect when visiting with lawmakers at the capital, how to prepare, how to follow-up) Please disregard 2017 dates shared in this recording. Join us for a live Session Preview Webinar with Cody Hand, NCHA Senior Vice President of Government Affairs. Tuesday, May 15, 2018 @ 12-1 p.m. Hear the latest and greatest from downtown Raleigh and ask your questions about the priority legislative issues on the table this session. This webinar is scheduled just prior to the convening of the 2018 short legislative session, and will help prepare advocates for visiting legislators during advocacy weeks. Legislative Building (LB) and Legislative Office Building (LOB) – Legislative offices are located in two buildings at the Capitol – The Legislative Building (LB) and the Legislative Office Building (LOB). In the LB, offices are located on the first and/or second floor. In the LOB, offices are located on floors three through six. Almost all of the legislative offices are small and staffed by an office staff assistant only. A map with corresponding legislative offices and names for both buildings can be found through the links below. Expect to get ‘turned around’ in either the Legislative Building (LB) and/or the Legislative Office Building (LOB). The building and signage are confusing; even those of us that go to the building daily get confused. Cody Hand and Emily Roland should be available onsite most days of the session. They can be reached at Cody Hand @919-793-8318 or Emily Roland @919-621-7915. When talking to your legislator, remember that meeting in their office in Raleigh is no different than when you are talking to them locally. Use the same approach you would use if you saw your legislator for 10 – 15 minutes at the local grocery, Rotary club meeting, or at the park. Keep your comments brief and specific. Always be polite, positive, and professional. Personalize the issues by describing how their decision can impact a specific situation in your community. If you don’t know the answer to a question, write it down and follow-up with them after the meeting. Make the ask for them to support or oppose an issue and/or specific bill. Thank your legislator for taking the time to meet with you and for their service to your community. Follow-up your visit with a personal thank-you letter (contact info on maps above) or invitation to visit the hospital. Legislators’ calendars change constantly (much like your own). If your legislator is not in the office, talk with the office staff and determine when they will return. If you can’t catch your legislator in their office, you might be able to catch them on the way to and/or from a Committee meeting. The legislator’s office assistant will be able to provide more detail.